The cranesbills make up the genus Geranium of 422 species of annual, biennial, and perennial plants found throughout the temperate regions of the world and the mountains of the tropics, but mostly in the eastern part of the Mediterranean. These attractive flowers will grow in any soil as long as it is not waterlogged. Propagation is by semi-ripe cuttings in summer, by seed or by division in autumn or spring. Confusingly, "geranium" is also the common name of members of the genus Pelargonium, which were formerly classified in the cranesbill genus. In the United States, true Geraniums are frequently distinguished from the less hardy Pelargoniums as (rather redundantly) "hardy geraniums" by gardeners and in the horticultural trade. 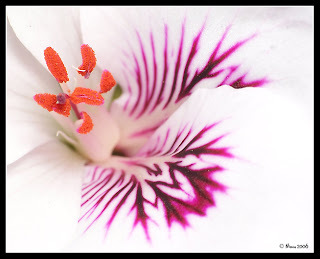 One can make the distinction between the two by looking at the flowers : Geranium has symmetrical flowers, while Pelargonium has irregular or maculate petals. Other former members of the genus are now classified in genus Erodium, including the plants known as filarees in North America. The name "cranesbill" derives from the appearance of the seed-heads, which have the same shape as the bill of a Crane. The genus name is derived from the Greek word geranos, meaning 'crane'. The long, palmately cleft leaves are broadly circular in form. Their rose, pink to blue or white flowers have 5 petals. Cranesbills are used as food plants by the larvae of some Lepidoptera species including Brown-tail and Mouse Moth. Les géraniums sont un genre de plantes herbacées de la famille des Géraniacées. Le groupe des géraniums regroupe différentes espèces, aux formes et aux biotopes très variés. Par la sélection variétale, on a obtenu de nombreuses variétés horticoles inédites : voir également l'article Pélargonium.